As expected, Anderson Silva and Michael Bisping got right in each others’ faces as they weighed in ahead of their UFC bout in London this evening. The UFC Fight Night 84 headline fight has been years in the making – Bisping (27-7) has been campaigning for it for ages, and Anderson Silva (33-6, 1 NC) has been keen on facing the Brit for a while too. Tonight, the two will finally square off, with British star ‘The Count’ looking to defeat perhaps the greatest mixed martial arts fighter of all time. If you weren’t already seriously hyped for the showdown between these two, however, you definitely will be after seeing how heated things got at yesterday’s weigh-in. 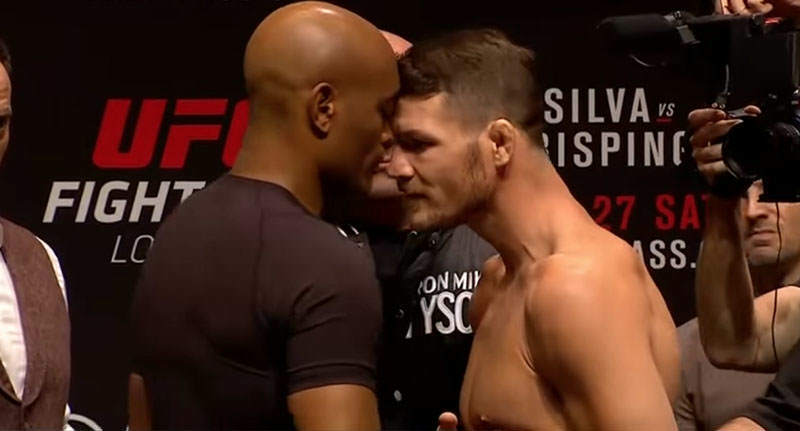 As reported by Yahoo Sports, both men made the 186lbs middleweight limit and, as the two faced off for photos, Bisping put out his hand for a handshake, but Silva appeared to once again reject the gesture and refused to shake, at least initially. The two then went forehead to forehead, with Bisping talking trash and Silva heatedly saying something back, as UFC President Dana White struggled to keep the two fighters apart. Afterwards, the 40-year-old Silva was pretty calm about the situation, noting he was looking forward to the fight and believes he has another title run in him before he retires. The fight will be Silva’s first in over a year, following his ban for failing a drugs test for two anabolic steroids prior to and following his January 31, 2015 bout against Nick Diaz. Silva has always denied steroid use, blaming the positive tests on a dodgy sexual enhancement drug his friend had given him. Let’s just hope that ‘The Spider’ isn’t firing blanks tonight because, if he’s at his best, he and Bisping should have a hell of a scrap in the UK!